My great-grandfather left Aix for America when he was just sixteen. He traveled alone intending to join several french families in Mexico where they would mine for silver. He maintained his "frenchness" it seems, for after his time as a miner, he became a dairyman. My great-grandfather's name in France was probably Jerome, but after living in Mexico (or maybe even before - this is unclear) he became Geronimo. Like the Indian. My father heard him laugh and say that on one particularly dark night, when he approached his mining companions and was asked "who goes there? ", he said "Geronimo" and there was a scramble, I suppose, for weapons. He quickly said "the French Geronimo." Not really knowing any of this, I had a sort of facination for the Apaches as a child and would always want to be Geronimo in our cowboy and indian games. 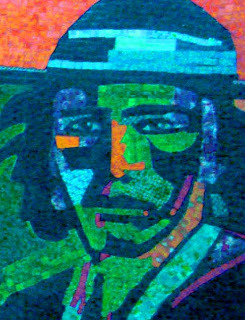 I've painted several "Geronimo" paintings...this one is paper mosaic, and is a young Geronimo who looks a little like my brother.